If your treasured vinyl records are skipping, there could be several reasons why. Dirt, dust or other debris in the grooves of the record are the most common cause of record skips. Your turntable's arm may need balancing, or the stylus could be worn out. The good news is that all of these problems can be fixed with a minimum of cost and effort. The bad news is, if the skipping is being caused by visible scratches on the surface of the vinyl, the record is most likely beyond repair. Identify the trouble spot where the record is skipping. Replay the skip a few times, taking note of how far into the record the needle is when it hits the skip. It is critical to know exactly where the problem is before you can begin to treat it. Remove the record from the turntable, handling it only by the edges. Hold the record in one hand using your thumb on the outside edge and your middle finger on the label. This prevents dirt and oils from your hands from coming into contact with the vinyl surface. Use a magnifying glass to carefully examine the record's surface in the area of the skip. Look for minute particles of dust or dirt that may have become embedded in the grooves. Also, check for surface scratches. If the problem is caused by anything other than a scratch, proceed to Step 4. Dust off the record with a lint-free cloth or record-cleaning brush. This should remove any superficial surface dirt. Rinse off the record with tap water. For particularly stubborn dirt, use a mild dish washing liquid and gently lather before rinsing. If you have hard water, use distilled water instead to prevent mineral deposits collecting in the grooves. Take care not to get the record label wet; labels exposed to water may bubble, crack and peel off. Allow the record to dry completely before you attempt to play it. Blotting or air drying on a soft lint-free towel works well. The vinyl will remain soft for a while after washing, and "wet playing" the record can damage it, so make certain the grooves are totally dry. Play the record again and see if it skips. Should the skipping persist, proceed to Step 8 for more advanced troubleshooting. Go back and check the previously cleaned problem spot on the disc's surface. There may some dust or dirt particles still remaining in the groove. If so, use a wooden toothpick (you may also use your fingernail) to gently push the dirt out of the groove. Be especially careful not to apply too much pressure; you could scratch the record this way. Test the record again on your turntable. If it is still skipping, check your stylus. If the needle shows signs of wear, replace it. Play the record with a new stylus. If this does not remedy the skipping problem, it is recommended you have a professional turntable repair facility balance the tone arm. 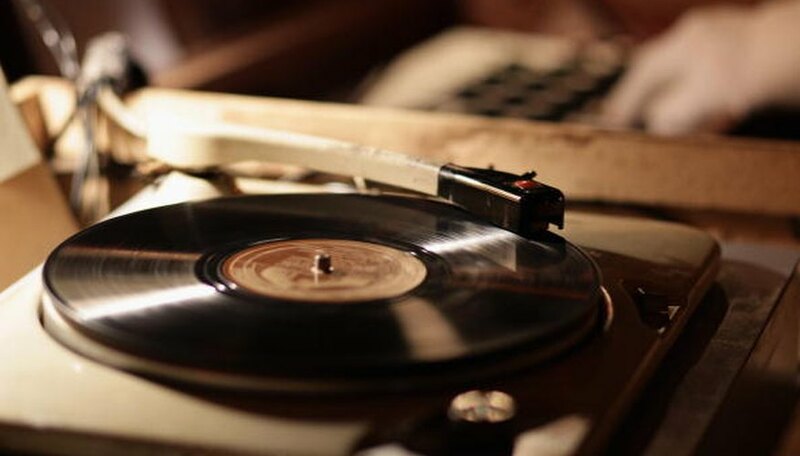 If you are trying to get a vinyl record to play once through during transfer to a digital format, you may be able to get a clean recording by applying gentle pressure to the tone arm. Putting a little extra weight on the arm forces the needle deeper into the groove and often the record will play through the skip. You may do this by simply taping a quarter to the tone arm, or by using your index finger to press down with a slight sideways motion on the stylus when it approaches the skip. Use this method sparingly and only as a last resort, however; it will likely cause some damage to the record. But if you are making a one-time digital transfer and probably won't play the record again, this method may be your only hope to save the original recording. Professional record-cleaning kits (such as the DiscWasher system) may be used as an alternative to cleaning with plain tap water. Such kits use a professional cleaning solution and lint-free brush that gently moves across the disc surface, lifting debris out of the grooves. For large collections, you may want to invest in a vacuum record-cleaning machine such as NittyGritty, VPI or the Spin Clean Record Washer. Do not use any cleaning solution that contains rubbing alcohol. These can permanently damage the record.